Reasonable Rants Science, skepticism, and the study of reality. Reading this book again (this time by listening to the audiobook) helped me absorb the complex concept of the Higgs Boson. Of course there is no particle at the end of the universe – this is a metaphor for the last remaining particle to be observed to finalize the Standard Model of particle physics; the elusive and enigmatic ‘Higgs Boson’. The Universe began with perfect symmetry at the Big Bang at incredibly high energies, and about a thousand-millionth of a second after the Big Bang that symmetry was broken by a process now called the Higgs mechanism. According to Quantum Field Theory, the most fundamental building blocks of the universe are actually vibrating fields (not particles), and the different vibrations of these fields result in the particles we observe. The Higgs field, proposed by Peter Higgs (along with others whose names were clearly less catchy), is what causes these vibrations to oscillate at certain values, breaking the symettry of the fields to form particles. Carroll’s use of the pendulum as a visual tool was very illustrative; when a pendulum is at a state of rest, it is at it’s lowest energy. The Higgs mechanism is like an upside-down pendulum: it takes more energy to get it to it’s rest state than it does for it to lean to one side or the other. This “leaning” to one side is the breaking of the symmetry, and depending on which side it chooses (called decaying), the field will be an electron, a quark, a gluon, a W or Z particle, etc. Each energy (or mass; Einstein’s E=MC2 shows us they are two measurements of the same thing) of the field is determined by how easily it moves through the Higgs field. Carroll illustrates this effect using a metaphor of a walk through a crowd taken by himself and simultaneously by Angelina Jolie. Jolie’s walk will be slower because she attracts more fans that swarm her and slow her down (giving her more mass). Since the Higgs Boson (a force-carrying particle for the Higgs field) existed for such a brief moment at the very beginning of the universe in a very high energy state, it’s discovery has eluded science until the Large Hadron Collider at CERN started smashing protons together at almost the speed of light and observing the fallout at those high energies. So that means that purely statistical fluctuations will give you a result way out in the 5-sigma range 0.00006 percent of the time. When physicists announce that they have a 5-sigma result, that means that there’s a 1 in 3.5 million chance that it was the result of a statistical fluctuation over the spectrum of experiments they performed. Particle physicists working on the CMS and ATLAS experiments are looking for “bumps” in their data that stand out from the background. When these bumps reach the 5-sigma level, they have very good reason to believe that they’ve discovered or observed a new particle. 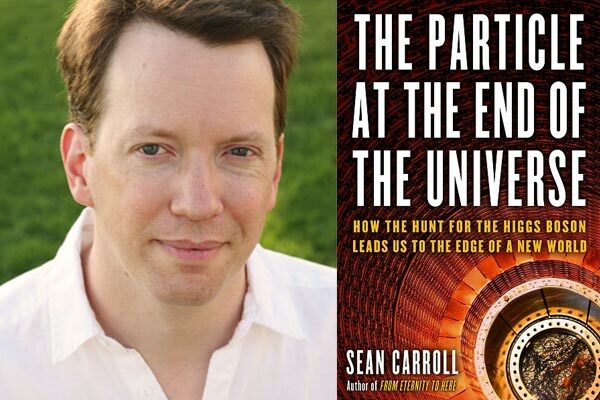 I really like Sean Carroll, both as an author and teacher, as well as public defender of science and reason. His lucid and entertaining style of writing makes the journey of discovery exciting and highly intellectually stimulating. If you haven’t read his book on time called “From Eternity to Here” or taken any of his Teaching Company courses on “Dark Matter/Dark Energy” or “Mysteries of Modern Physics -Time” you should make an effort to do so. You’ll come out the other side with a stronger understanding of the concepts of modern physics and cosmology, and a different and more informed view of the universe around you.